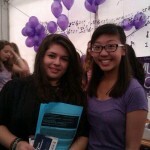 All the fun of the Freshers’ Fair | Music Matters | Because it does. Doesn't it ? 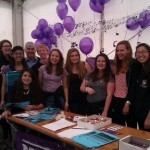 Well done to the new Music Society team for their hard work both yesterday and today; today the society stall was awash with people signing up amidst a thronging hubbub in the Eliot marquee. 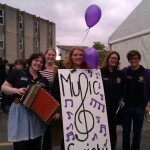 Last year’s President, Emma, cheerfully serenaded passers-by with her accordion – one expected to see spontaneous Morris dancing break out or riotous shanty-ing – whilst the string-players were out in force, with Amy gainfully sporting the sandwich-board whilst Chantelle and Leilan press-ganged – sorry, encouraged – potential Camerata and Orchestra players to sign up. Elsewhere, the rest of the society team were manning – and womaning! – the society stall amongst the surging hoardes. Well done, team; it all starts next week…! 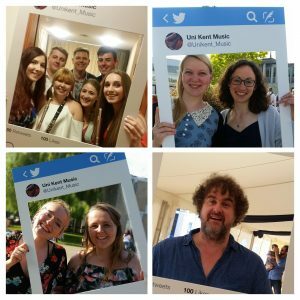 Previous PostPurple patch: Music Theatre Society on the foyer-stageNext PostLunchtime concert series begins on Wednesday: from Rags to Riches!